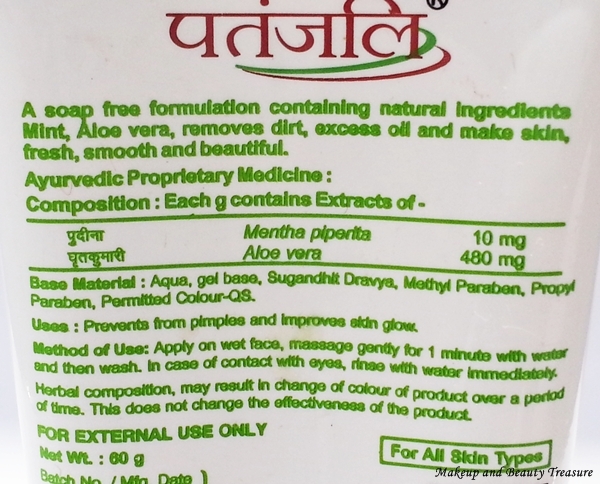 Patanjali skincare products are hits and misses. I loved Patanjali Charcoal Face Wash (Review HERE) but Patanjali Rose Face Wash (Review HERE) did not suit my oily skin at all. I also bought Patanjali Aloe Vera Mint Face Wash along with few other Patanjali products. It is priced at Rs 45 and you can buy at any Patanjali store in your city. 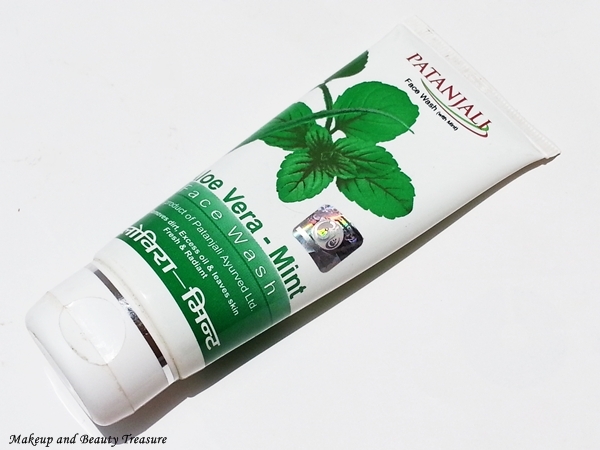 Patanjali Aloe Vera Mint Face Wash comes in a sturdy opaque white tube with a flip top lid. 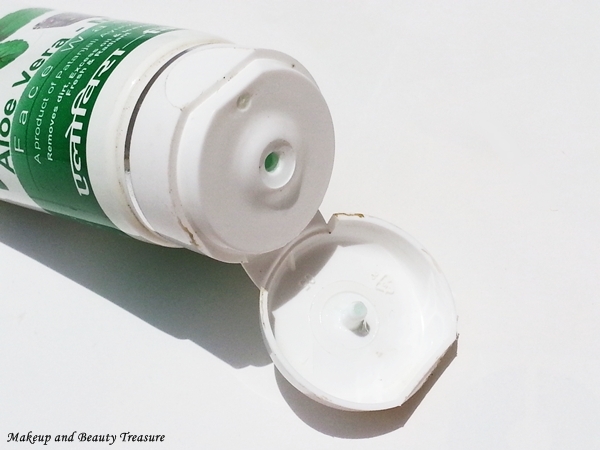 The lid is quite tight and the tube can be safely carried around in a bag while traveling. The face wash is clear with gel consistency. It has mild and pleasant scent and would not bother sensitive noses. I simply take adequate amount of face wash for my both face and neck. It lathers decently and feels soft and nice on the skin. It rinses away quickly without leaving a residue behind. My skin feels soft, smooth and clean. It does its job of cleansing well but if you are into deep cleansing then it might not be for you. It does not dry out the skin so I feel it is meant for all skin types. I have oily skin and it removes all dirt and oil off the skin. It does help in preventing pimples and acne with regular usage. I have not faced any adverse effects whilst using it. The face wash contains aloe vera and mint that are great in keeping the skin clear and healthy. • Removes dirt and oil off the skin. • Does not do deep cleansing. Patanjali Aloe Vera Mint Face Wash is a good everyday face wash to keep your skin soft, smooth and clean. It does its job of cleansing well without drying out the skin. It worked nicely on my oily, acne prone skin. I would definitely recommend it you if you are looking for a nice and mild face wash.
• If you have dry skin follow it up with a good moisturizer. • If you are wearing makeup, make sure you remove the makeup first with a makeup remover and then follow it up with this face wash.
• If you have extremely oily skin then you might not like it as it does not do deep cleansing. You would love Patanjali Charcoal Face Wash.
What is your favorite face wash from Patanjali?